Update: This casino is unfortunately no longer online. For a list of live casinos check out our online casino reviews. Free Spins Casino is an online casino which offers slots, table games and much more. They possess several online gambling licenses, one from the Malta Gaming Authority, one from the Gambling Commission in the UK and a third granted in Curaçao. FreeSpinsCasino has decided to offer an out-of-the-box reward system for their players. Creating an account on Free Spins Casino is a piece of cake. It’s only a two step process. You start with the usual by filling in some information like your email address and choosing your password. To complete the second step you have to click on the activation link that you’ll receive in an email. We’ve received it within seconds and were immediately logged in to the account afterwards. The site lay-out is quite simple and we found that Free Spins Casino really let’s the casino speak for itself. The top of the page shows several buttons such as Home, Casino, Live Casino and News and Promotions. In the left top corner you can find the account button which takes you to a section that shows your account and other relevant information. Free Spins Casino takes a different approach then all other online casino’s we’ve ever encountered. You might have guessed it but Free Casino is very fond of giving free spins. On your first deposit (of minimum €25) you’ll receive an enormous amount of free spins. Besides that you will receive free spins on every deposit you make. Yes, every deposit. The team behind Free Spins Casino shows their appreciation for players by constantly rewarding them with free spins. Regular spins – Value is 10 cent per spin. You can choose to receive these spins on Starburst, Aloha or Pyramid: Quest for Immortality. Super spins – Value is 1 euro per spin. You can choose to receive these spins on Gonzo’s Quest, Jack and the Beanstalk or Guns ‘N Roses. Monster spins – Value is 2,50 euro per spin. You can choose to receive these spins on Twin Spin, Theme Park or Victorious. On the first deposit you can choose between the three free spin types: You can either claim 999 regular spins, 100 super spins or 40 monster spins. We’ve never come across any online casino that offers this many free spins. If you make a deposit of €25 this means you’ll receive 400% of your deposit worth in free spins. As Free Spins Casino doesn’t focus on any country in particular they offer deposit methods that are popular in most countries, as well as some country specific method. They ofcourse offer card payments such as VISA and MasterCard. Furthermore they offer two e-wallet solutions, Neteller and Skrill. Keep in mind that you need to create an account with either one of these two providers and top up your account there in order to make any online payments. They also offer the option to pay via bank transfer for which you need to add some specific information on the transaction. The most anonymous payment option they offer is Paysafecard, which is a type of prepaid voucher solution. The vouchers can be bought in thousands of stores and comes with a 16 digit PIN that has to be entered on the payment page in order to make a deposit. 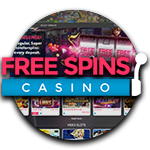 There are two areas in Free Spins Casino, the casino section and the live casino section. In the casino section you can find video slots, slots, table games, etc. In the live casino you can find all sorts of table games that are streamed live with a dealer. The casino section is divided in several categories: popular games, video slots, slots, table games, video poker, and other games. There are 143 video slots, 20 regular slots, 40 table games, 4 video poker games and 18 other games including Germinator, Super bonus bingo, and Bubble Bonanza. The live casino counts 9 live roulette and blackjack games. The casino allows you to try out the tables by offering a ‘play for fun’ option, which is great for first time players who want to gain a bit of experience before playing for the real deal. We’ve covered pretty much anything you should know about Free Spins Casino. However, should you have any questions you can always get in touch with their support team. They’re available via email as well as livechat and phone for urgent questions.